As promised, I’m doing a whole lot of prep and promo for Video Rage. I think I might be putting out a new VR-related post every Sunday up until the book comes out. By the time June 1st roles around, you’re probably either going to be very excited for this book, or you’ll be sick of me talking about it. I’m really hoping it’s the first one. Anyway, this Sunday I’ll be doing as promised and posting an excerpt from the first chapter of VR. If you’re curious as to what my writing style is like when I’m writing fiction and not blogging, this is a pretty good way to get a sense of it. It takes place not too long after the end of Reborn City, and tells us what the Hydras have been up to since the end of the first book. If, at the end of this excerpt, you find you like what you’re reading, you can pre-order the e-book version of Video Rage from Amazon. If you would like to read the first book before you do that, though, you can read an excerpt for that here and then find RC on Amazon, Createspace, Barnes & Noble, Nook, and Smashwords, with more sites to follow in the next couple of days (if all goes according to schedule). I look forward to hearing your thoughts on the excerpt. Happy reading. 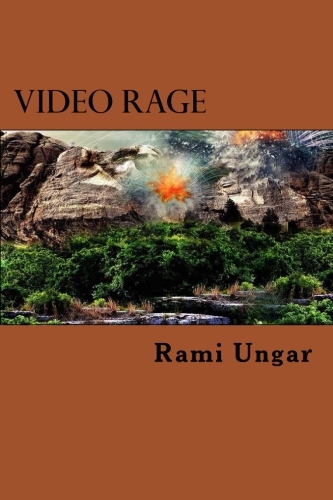 I’m off to conduct interviews with some of the characters of Video Rage (for the character interviews from Reborn City, check out the Interviews page). Have a good one, my Followers of Fear! The sunbaked concrete and metal shimmered in the hundred-plus degree heat, while the many cars and trucks reflected light off their chrome bodies like blinding beasts zooming down the highway. As truckers listened to country and rock music and children played video games on the backs of their parents’ car seats, some occasionally looked out to see a marvel of the modern world on the road. Five black hoverbikes, each with two people straddling the seats, zoomed between vehicles as they floated a few feet above the ground. Those who saw them marveled, paying no attention to the riders, who would’ve warranted their own attention if the drivers knew who they were. Zahara blinked, unable to find them. Where did Rip and Miguel go? At once she felt the familiar biting fear, the sense of impending doom. Where did they go? Her heart was hammering. She was about to give the signal to alert the others when the hoverbike appeared a few cars ahead, shifting from behind a boat to the next lane over. Zahara sighed with relief as Rip and Miguel fell back a bit and rejoined the rest of the group. For a moment there, she’d feared the worst. Up ahead, Miguel raised his right arm and pointed his index finger towards the sky. From behind Zahara, Ilse called out “Finally!” and raised her arm to signal the others that a rest stop was up ahead. Iori raised her arm a second later, followed by Owl and Rico’s arms as well. When Miguel saw that all the arms were raised, he let his fall back to his side and tapped Rip on the shoulder. A moment later, their hoverbike was listing to the right-bound lane, getting in line for the exit. Zahara banked to the right as well and fell in line behind them. A squeeze on the shoulder from Ilse a moment later told her the others had gotten into the turn lane as well. As they turned into a large parking lot with a fuel station and a large indoor food court, Rip led the Hydras around the parking lot and to the pumps, pulling into the first available one he could find. Miguel and Rip slid off the bike, the former joyfully stretching his limbs while the latter pulled off his sunglasses and went to examine the pump. Zahara had just taught the Hydras the other day about the diet observant Muslims ate. Although they said they understood it, Zahara thought that the others found the whole concept a little mystifying, especially the prohibitions against pork and alcohol. The Mercedes drove off and Zahara slid into its spot, switching off the engine and swinging her legs over the seat. Taking off her helmet, she shook her hair out, letting it free for the first time in several hours. Since they had left Reborn City, all the Hydras had been taking pains to disguise themselves so as not to be recognized. Zahara had let her hair go back to its natural brown color and had even cut it so that it just barely brushed her shoulders. Personally, she was glad she wasn’t a blonde anymore, something she’d only put up with because her mother thought it would help her fit in. And besides, it made blending in easier. Zahara felt eyes on her and glanced to see Rip looking at her. As soon as she looked though, Rip turned back to the pump console, selecting what sort of fuel he needed. Seeing him only reminded Zahara that she wasn’t the only one looking different. Not long after leaving Reborn City, Rip had dyed his hair to what he called his original hair color. It was actually a nice shade of brown, warm and soft like a teddy bear’s fur. She actually thought Rip looked better with it, especially now that he was letting his hair grow out of that military buzz cut of his. And of course Rip never said it himself, but Zahara got the feeling that he liked it better too. Turning back to the console, Zahara selected the “Credit Pay” option, and then inserted her trick card. The thin piece of plastic, which contained a virus in its computer chip, fooled the computer in the pump’s console into thinking she’d given the machine a legitimate credit card, and unlocked the nozzle for her. She didn’t like using the trick card—it somehow made her feel dirty—but desperate times called for desperate measures, and these were certainly desperate times. Zahara looked at the Hydras, the ones that had stayed behind to refill tanks, and saw that each one of them looked guarded, like they were expecting an attack at any moment. As she knew all too well, every single one of them had good reason to look that way. Just a few hours after they had bolted out of Reborn City on the stolen motorbikes, a bulletin had hit the Internet that the Hydras were being classified as Class A terrorists by the Parthenon Company for blowing up their Worldwide Headquarters. Of course, the Hydras knew the story was a lie. 011, the insane super-soldier that Parthenon had created with an advanced mutation formula, had blown up the Parthenon building when he had used his strange explosion ability in a room full of hydrogen gas. However, the rest of the world didn’t know about 011, who the Hydras really were, or that Parthenon had been experimenting with human test subjects to create super-soldiers like the Hydra leaders. And since Parthenon was the reigning government in several cities across the continent, they had the ability to create a story that suited their purposes and no one would contradict it. And according to the official story, the Hydras were originally just a normal street gang, but the addition of a radical terrorist into their ranks caused them to turn to terrorism in the name of a sick religion which wanted to expand its influence across the world. That radical terrorist was supposed to be Zahara, who made the perfect scapegoat because she was a Muslim, and therefore, in the eyes of the world, she was born dangerous and hateful. Since the bulletin had gone out, the Hydras had had to be very careful about being seen in public, especially on the highways where they were sitting ducks for any law enforcement, military groups or bounty hunters wanting to catch Class A terrorists. Aside from hair changes with Rip and Zahara, Owl wore sunglasses most of the time to mask his yellow eyes. Each had changed their appearance in small but significant ways. They had even erased their Hydra tattoos using a tattoo-removal gadget that Max Frimms had given them back in Reborn City. Not that Zahara minded. The summer was hot, and it felt good to be in a grey cotton T-shirt and white shorts, even if the shorts did go above her knees. And the others seemed to like it too, even if they did seem a little hesitant to try on new colors. There was a beeping noise and Zahara pulled the pump out of the fuel hatch. As she did, she felt something cold and wet on her neck and gave a surprised squeak. Turning around, she saw Ilse holding a can of soda and two bags with a dancing burger-man above the logo. As the others finished fueling up their bikes, they drove out of the fuel station and to a shady little copse of trees next to the food court. Sitting under the shade, the Hydras ate their lunches as parents tried to keep their kids from running too far away and dogs chased after Frisbees. A couple of times Ilse and Zahara tried to start a conversation with the others, remarking on the heat or that boys were wearing sequins on their clothes these days. Mostly there was silence, and after a while they stopped trying and decided to focus on eating, which made it easier to watch the crowds anyway. As they finished their lunches and started heading back to the hoverbikes, a large black SUV pulled into a stop next to Alto’s bike. Several college kids wearing University of Toledo shirts tumbled out of the SUV’s doors, laughing and shouting as they gathered around a girl with a tablet. “Let’s move quick,” said Miguel, eyeing the students from the SUV. One of them had just looked at the Hydras and had said something to the girl holding the tablet, who was now looking something up as fast as her finger would let her surf. All the while the others were looking up and staring at the Hydras on their motorbikes. Before the girl with the tablet could finish her search, the Hydras zoomed out of their parking spaces, leaving the teens from the SUV choking on their dust. As they drove away, Zahara glanced back in worry. She wondered if perhaps the teens had identified them. And if they hadn’t, how many close calls would they have before someone actually did find them and identify them?